As its name implies, K2's Wayback is a touring/ski mountaineering-specific plank designed for longer and deeper forays into the backcountry. The Wayback weighs in at a respectable 6 lbs 8.5 ounces per pair (167cm/measured), while offering 88mm of width underfoot. Yes, this is a tad skinny by today's freeride standards, but for that compromise you're getting a good weight-to-area ratio plus a relatively modern shape/design, including a touch of tip rocker plus a progressive (shallow) sidecut. 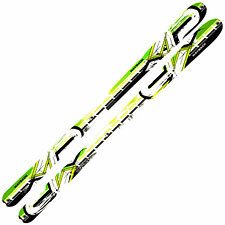 The result is a light and balanced ski perfectly suited for most backcountry conditions. In addition to the Wayback's appealingly-low weight, touring-specific features include holes with removable plugs in both tips and tails for mountaineering/sled use (and also for attaching K2-brand climbing skins), a notched tail for attaching generic skins, and a flat tail, for creating ski belays. On the snow, the wood core (Aspen/Paulownia) Wayback quickly impresses with its friendliness across a variety of conditions. While the tip rocker is subtle, it proves effective in getting the ski through softer and more variable snow, particularly at this (somewhat) skinny width. The ski proves versatile when it comes to turn shape, happily churning out short or longer-radius arcs as you desire. At higher speeds, you will begin to outrun the ski's comfort zone, especially on harder snow, so I'll say keep it under 30 mph or so for best results—which is certainly reasonable given its backcountry orientation. On super-steep pitches, I do notice just a touch of 'stickiness' in the tail—a direct consequence of the tails' flatness. The addition of a little tail rocker would be much appreciated here, regardless of the loss of mountaineering/belay functionality (in my opinion, at least). I understand and accept that I am going to be making compromises when it comes to my touring gear. If not, I'd be skiing a Alpine rig and begging for helicopter rides. That said, the Wayback acquits itself nicely. For the weight, the surface area and stiffness are good, and the feel is decidedly modern, meaning you won't find yourself cursing your skis when the snow gets difficult, and you'll definitely enjoy yourself when the snow is more cooperative. Especially as a ski mountaineering tool, the Wayback is an easy ski to like. Anywhere short of in-bounds charging, you'll find the ski light, agile, and confidence-inspiring. Note that K2 measures length differently from European makers: a 167cm Wayback is the same, tip-to-tail, as my 170cm Atomic TM22. When sizing the Wayback, I'd recommend treating it as if it were traditionally cambered. Don't worry about rocker compensation—as mentioned, the tip rise is subtle, and the tail is flat.